In a pot, sauté onions with olive oil over medium heat. Stir in tomato paste and sauté for 1-2 minutes. If you are using fresh spinach, wash, drain and then chop. If using frozen spinach, just add them into pot. Cook them over medium heat stirring occasionally until most of the water evaporates (5 minutes). Stir in bulgur and add hot water, crushed red pepper and salt. 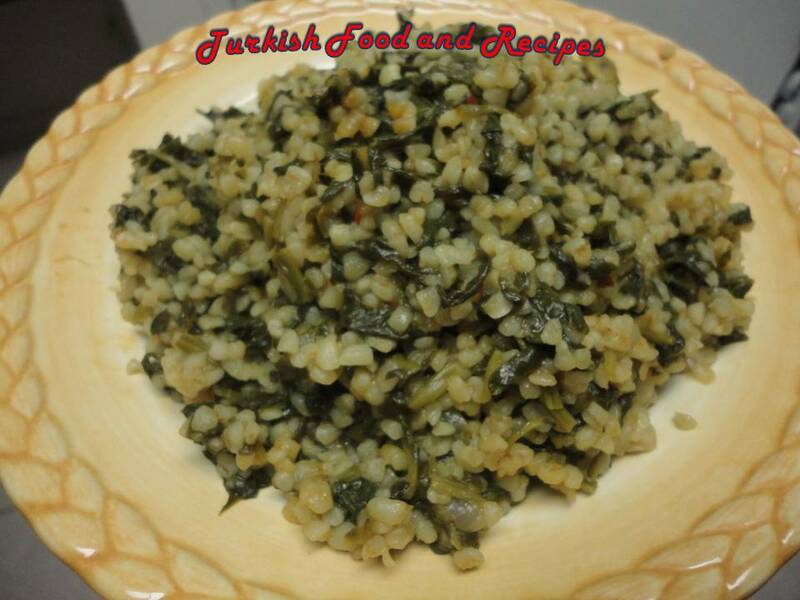 Close the lid and cook over low heat for 20-30 minutes, until the bulgur is cooked. You may serve it with yogurt on top or on side. Yikanmis ve suyu suzulmus bulguru ilave edin. Sonra sicak suyu, kirmizi pul biber ve tuzu ilave edin. 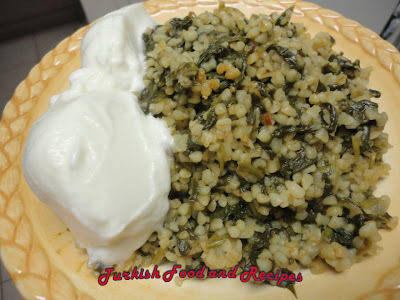 Kapagini kapatip kisik ateste yaklasik 20-30 dakika bulgur pisene dek pisirin. Yaninda veya uzerinde yogurt ile servis yapabilirsiniz. Hi! What type of Bulgur can I use for this dish? I only have fine.. will it work? I'd prefer coarse bulgur with this recipe. Fine bulgur might turn this this mushy. Hi again, and thanks for the answer about bulgur type. I love your recipes. LOVE.